I have been quite fortunate these past 10 days or so to have a relatively “easy” school load. This is, of course, the calm before the storm. I spent a month preparing lesson plans and grading schedules to allow me to participate in the 24 hour read-a-thon. This will mean, however, that the weeks of October 26 – November 8 I will be making up for this time off. Oh well, it will be well worth it next weekend when I will have little guilt while enjoying one of my favorite past times. I have already written about my book buying sprees – both in reality and virtual bookstores – but I have also spent quite a bit of time reading. I am learning, however, that if I don’t write the review right away, I lose momentum for the story and have a VERY difficult time recalling appropriate details. I hope to develop a good reading/reviewing schedule to follow in my 2nd year of blogging, but for now I plan to rectify that problem with a series of mini-reviews. Over the past couple of weeks I have completed 2 books – and left one book unfinished – for the RIP IV challenge. These books will be reviewed in a forthcoming post (otherwise this post would be WAY too long). These books include: The Sweetness at the Bottom of the Pie, We Have Always Lived in the Castle, and Angelica. This week I managed to finish reading a modern day classic, The Catcher in the Rye, began listening to the audio book, What the Dead Know, and started the memoir, A Big Little Life. Yes, my literary life has been full, even if I have not blogged much about it. A couple of weeks ago I asked you to recommend audio books in an effort to help me expand my literary horizons. You had some GREAT ideas and I immediately ordered The Shadow of the Wind and The Historian from my local library. When I went to pick them up, I also decided to take a gander at other audio book offerings sitting on the shelf. 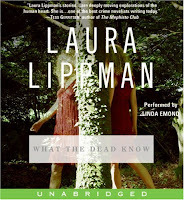 I found What the Dead Know by Laura Lipman, a book that has been on my TBR list for quite a few months. I checked out all three and immediately began listening to the latter. I am now on disc 4 and thoroughly enjoying the narrator (who provides different voices for each of the characters — the voice of the male detective from Long Island is just perfect!). Not only is the narrator a pleasure to listen to, but the story itself is quite captivating. Unfortunately I have not done much driving since I obtained the book, and since the CDs remain in my car, the “reading” of this novel is rather slow going. On this same trip to the library I decided to take a chance and see if Catcher in the Rye was available on the shelves. While I have heard of this book since high school (although for some reason I was never required to read it), I had really forgotten about it until this summer when one of the professors shared an essay that he had written comparing Holden Caulfield to some of the Russian protagonists of Tolstoy and Dostoevsky. While I found his essay to be compelling, I am sure that I would have appreciated it far more if I were familiar with any of the writing to which he referred. I decided to start with this American class which is only 248 pages, vs the Russian masterpieces that run well over 800 pages. On the one hand I can understand why this book is a classic. The way in which J. D. Salinger captures the heart, mind, and soul of a tormented 16 year old prep school adolescent is quite fascinating. It is almost as though the reader is witnessing a constant stream of consciousness of this young man’s life. We read every thought, we are told every visual description, we are present for every conversation that he has over the three day course of the novel. My overall reaction to the book, however, is somewhat mixed. Perhaps if I had read this book in high school I might have had a different reaction to Holden’s commentary. As a nearly 50 year old woman, however, I did feel sincere compassion for this young man who is obviously still struggling with the death of his brother. I am not sure that he has found a way to properly grieve for Allie, and so instead he wanders aimlessly through life, managing to get expelled from several of the top academic prep schools on the East Coast. Unfortunately, his constant cussing and blasphemous talk made it incredibly difficult for me to even finish the book. I haven’t decided if the language is needed and in part helps to make the statement – or if the language is so offensive that it causes many readers to stumble and miss the thematic points. In either case, I did rate the book 3 out of 5 stars. I finished Catcher last night and was hoping to begin something a bit more light-hearted. As I was browsing my bookshelves I came across A Big Little Life by Dean Koontz, an ARC that I managed to pick up last May at the BEA (Book Expo of America). I am now about half way through the book and I must admit that it is just what the doctor ordered. I am ashamed to say that I have never read a Dean Koontz fictional novel, but that will soon change. I truly enjoy his writing style, his sense of humor, and his life’s priorities. At the time he and his wife Gerda adopted their golden retriever, Trixie, they had been married for 32 years! They have an amazing work ethic (in fact, they purchased a beach house for the express purpose of forcing themselves to take a break and “only” work 60 hours a week) and apparently a mutually respectful, loving relationship. This story is not a Marley and Me knock-off (something that I was afraid might be the case). This is a story of how one dog can instantly turn a couple into a family. Trixie was trained to be a service dog, but due to elbow surgery at the age of three, she had to retire. Dean and his wife are avid supporters of the Canine Companions for Independence and had toyed with the idea of adopting one of their released dogs. Trixie became available, they accepted her, and instantly their life was changed for the better. While I know how the book will end (the dog always seems to die)…..I am most anxious to finish the story. The author manages to infuse a sufficient amount of humor with the poignant tales of love and compassion. If this book is any indication of Koontz’s typical writing style, I would be most grateful for any recommendations of his novels if you are familiar with his works. I have become so taken with his love of Trixie, that I would like to get to know his fictional characters as well. So that is my personal literary week. On the education front, we are about half way through the Prologue to the Canterbury Tales in my British Literature class; we have read through chapters 11 of To Kill a Mockingbird in my 9th grade English class; we will be finishing Tuck Everlasting in my 7th grade English class; my 8th graders have had a great time blocking and practicing the first two Acts of A Midsummer Night’s Dream; and the lunch time book club has elected to read the Sherlock Holmes’ Adventure – The Red-Headed League. I hope you have had a great literary week as well — and that you are giving consideration to participating in the Read-a-thon this coming weekend! Great reviews! I've read several Dean Koontz books, though it's been quite a few years. I always preferred him to Stephen King. I'm so glad you're going to be participating again. And Canterbury Tales, huh? I always really enjoyed studying that even though it was more work than I liked to do back then. I am the same way when it comes to writing reviews. I at least have to get a rough draft written after finishing a book or else I lose something in between the reading and the writing. I read Catcher in the Rye when I was in high school and really liked it. I wonder what I'd think of it now. I really like Dean Koontz's writing. I haven't read the book you mention and am not sure I will given the way the book ends. These mini reviews are a nice change of pace. I find that it's hard to write reviews if too much time has elapsed, yet I need enough time to solidify my thoughts. I'll have to look into the audio of What The Dead Know. Dean Koontz was the first author that I ever stood in line to meet! I love him. He's witty and extremely pleasant to be around. I sort of grew out of thrillers but every once in awhile I pick up one of his books to remind me of the good ole days. I cannot wait to read his book about Trixie. He wrote Watchers, which I highly recommend and it featured a Golden too. I sure like these literary reports – what you are reading and what you are teaching. You have a great life doing the things you love to do. I re-read Catcher after reading Prep, an updated female version of Catcher. They are an interesting pair to read in proximity.